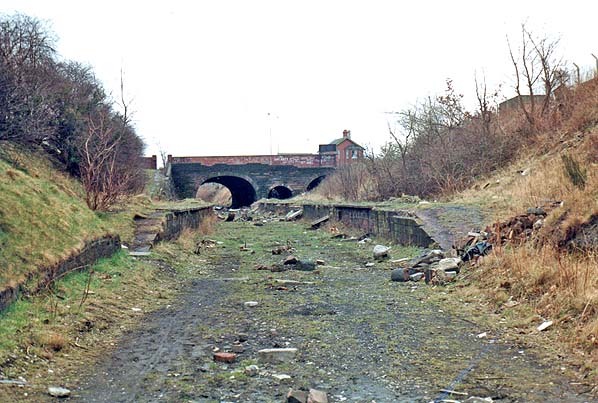 Present state: Mostly demolished but gate and access ramps from road level as well as parts of the platform can still be seen. .
Notes: Knotty Ash & Stanley station was situated on the Cheshire Lines Railway (CLC) North Liverpool Extension Line that connected the CLC Liverpool and Manchester line at Halewood to Aintree and via a branch to the north Liverpool docks at Huskisson Dock. The CLC was a joint railway with three partners, the Great Northern Railway (GNR), the Manchester Sheffield & Lincolnshire Railway (MS&LR) and the Midland Railway (MR). All had wanted access to Liverpool which, by the mid nineteenth century, had become a major seaport. The CLC Liverpool and Manchester line which opened on 2 September 1873 had given the three companies access to Liverpool but only to the south docks. To the north of the city new docks had been built to accommodate much larger vessels. The London & North Western Railway (LNWR) and the Lancashire & Yorkshire Railway (LYR) had access to the north docks and the CLC partners wanted the same. The most logical way for the CLC to gain such access would have been for them to extend their Liverpool and Manchester line by three miles from its Liverpool terminus. However this would have involved tunnelling under the city centre which would have been prohibitively expensive. The alternative solution was to build a line around the eastern edge of the city using agricultural land that was, by the 1870s, very cheap. The only significant engineering that would be required was at Walton north of Liverpool. The North Liverpool Extension Line and its branch to Huskisson was authorised on 30 July 1874 and opened from Halewood to Walton-on-the-Hill on 1 December 1879. Knotty Ash station opened with the line on 1 December 1879 as Old Swan & Knotty Ash. It was to the west of the village from which it took its name. It was located in a cutting on the north side of Prescott Road. The main station building straddled the line at street level. It was a two storey building similar in design to those at West Derby and at Gateacre. The bridge that supported the station building was of two arches and constructed from sandstone. Each arch was capable of taking two tracks. Only the eastern arch was actually brought into use. The western arch was built with future expansion in mind. The CLC considered that at some point in the future the line, built as a double track railway, would need to be quadrupled. All the road over railway bridges, and the tunnels along the line were built with quadrupling in mind. It never would expand beyond a double track line. Ramps led down to the platforms on either side of the line. Both platforms were provided with waiting shelters. At the north end of the down platform there was a water tower for locomotives. Old Swan & Knotty Ash had a large goods yard which was located on the south side of Prescot Road on the east side of the line. It was provided with cattle pens and was used to bring in animals destined for the abattoir at Stanley a mile to the west. A signal box was located on the west side of the line opposite the goods yard. It was a timber structure. At the time of opening Old Swan & Knotty Ash was served by trains running between Walton-on-the-Hill and Liverpool Central. Walton-on-the-Hill was a temporary terminus on the Huskisson branch as tunnels leading down to the docks had not been completed. They were ready by 1 July 1880 when goods services began to run to Huskisson. Passenger services were extended to a new terminus at Huskisson on 2 August 1880 (although race day specials had run from there on 13 July 1880). For race meetings at Aintree special trains were run for the first time on 13 July 1880 to a CLC station at Aintree provided for just that purpose. Old Swan & Knotty Ash would have been served by some of these trains. The CLC owned its own rolling stock but it did not own any locomotives. All local CLC services were hauled by MS&LR locomotives. On 1 November 1888 the CLC renamed the station Knotty Ash & Stanley. The December 1895 timetable showed Knotty Ash & Stanley as having 14 up and 15 down trains on Monday-to-Friday as shown by the table below. On Sundays there were six up and five down trains. The city of Liverpool had expanded rapidly during the nineteenth century and by the early twentieth its suburbs extended as far as Knotty Ash. The Liverpool Corporation Tramways had opened an electric tramway line to Prescott by May 1903 which passed along East Prescot Road, running directly in front of the station. The trams took a direct route to Liverpool of only a few miles: by train the journey to central Liverpool was nearly nine miles. The trams had an adverse impact on revenue at Knotty Ash. After the United States entered the Great War a large US Cavalry depot was established in the fields to the east of the railway at Knotty Ash from 1917. The area was chosen because there was plenty of grazing land for the horses which had endured an Atlantic crossing, and the station goods yard was ideal for loading horses onto trains for onward movement to the Channel ports. The depot remained in use until 1919. On 1 January 1918 the service between Liverpool Central and Walton-on-the-Hill was withdrawn. Despite the loss of this service Knotty Ash was still well served, the July 1922 timetable showing 12 trains in each direction on weekdays. Most of the up trains ran to Manchester Central but a few did provide a service to Liverpool. At the grouping of 1923 the CLC remained independent but its parent companies changed. The GCR and the GNR became a constituent of the London & North Eastern Railway (LNER) whilst the MR became part of the London Midland & Scottish Railway (LMS). The LNER was given two-thirds of the CLC shares and the LMS one-third. Motive power for CLC services was provided by the LNER. The signal box at Knotty Ash & Stanley was replaced with a CL2c type with effect from 25 February 1923. It was also of timber and had a 28-lever frame. The summer timetable for 1932 showed Knotty Ash & Stanley as having ten trains in each direction. There were two each way on Sundays. Ten trains ran to Southport Lord Street, eight to Manchester Central, and one each to Warrington Central and Liverpool Central. During the 1920s Liverpool Corporation widened Prescot Road into a dual carriageway, with the tramway at its centre on its own segregated tracks. The widening of the road necessitated the demolition of the station building at street level. To compensate new buildings were built on the platforms. They were almost mirror images of each other being austere brick-built single-storey structures with ridged roofs. During the Second World War passenger services on the line were cut back. The route through Knotty Ash & Stanley was of national strategic importance as it provided a link between Britain’s western gateway (Liverpool Docks) and the rest of the country. The line was extremely busy, freight trains running day and night almost in convoy. The only exception with regard to passenger services was between 24 December 1940 and 5 July 1941. Heavy bombing had damaged the extremely busy commuter line between Southport Chapel Street and Liverpool Exchange at the Liverpool end of the line. To enable Southport commuters to travel into the city and return home each day extra trains were provided between Liverpool Central and Southport Lord Street. The journey would have taken much longer, but it allowed the city to continue functioning. These trains would not have called at Knotty Ash. On 1 January 1948 the CLC became part of British Railways London Midland Region. The summer timetable for 1948 showed Knotty Ash & Stanley as having ten up and eight down Monday-to-Friday trains as shown in the table below. There were eleven up and eight down on Saturdays and four in each direction on Sundays. The new nationalised railway saw no need for the former SCLER as it could run trains from the North Liverpool Extension line to Southport Chapel Street via a connection with the former LYR network at Aintree. The SCLER passed through sparsely inhabited country and was unremunerative. Passenger services between Aintree (which British Railways renamed Aintree Central on 1 July 1950) and Southport Lord Street were withdrawn from 7 January 1952. Knotty Ash & Stanley was left with a scheduled train service that ran, in the main, between Aintree Central and Manchester Central. The station was also served by summer excursions to Southport Chapel Street. For local journeys Knotty Ash station was of limited value: by summer 1957 its service had been reduced to only three up and three down trains on Monday-to-Saturday as shown in the table below. With the last up departure being at 8.18am and the first Monday to Friday down departure being at 5.59pm the service was next to useless for anything other than work journeys. Despite the reduction in services on the line, British Railways carried out some modest updating of station signage, installing maroon totems at Knotty Ash (minus ‘and Stanley’) of the fully-flanged style which were used from 1957 onwards. Electric lighting was also installed at Knotty Ash, either late in the CLC era or by British Railways. It came as little surprise when British Railways proposed the withdrawal of the service in 1960. The last regular trains to serve Knotty Ash & Stanley ran on Saturday 5 November 1960, and the station closed to passengers on Monday 7 November 1960. The goods yard remained in use as a coal yard. The station saw occasional calls by excursions during the 1960s. The line itself continued to be used by Grand National race day trains until 1963; it then went into decline. 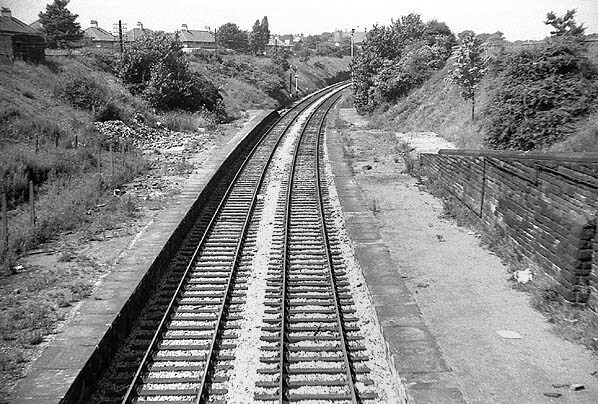 On 22 September 1968 the line between Fazakerley South Junction and Aintree Central was taken out of use leaving only the goods services to and from Huskisson and coal trains to the goods yard at Knotty Ash. On 30 November 1969 the line between Walton-on-the-Hill and Knotty Ash was singled. Knotty Ash & Stanley signal box closed on 18 January 1970 and was replaced with a ground frame. The coal yard ceased to be rail-served from 1 May 1972. The connection to the yard was taken out by 20 October 1972. On the same date the line from Gateacre to Knotty Ash was singled. By 1973 there was only one daily freight working from Edge Hill to Huskisson and return; it ceased in August 1975. By this time the Merseyside Passenger Transport Authority had come into being. Based on plans drawn up by the local authorities in the 1960s the line through Knotty Ash took on a new significance. It was proposed that an outer belt line be created along the former CLC North Liverpool Line, and it was actually authorised by an act of 1971. Although many of the lines proposed in the 1971 Act were created, the economic downturn of the late 1970s and early 1980s ended hopes for the belt line scheme. 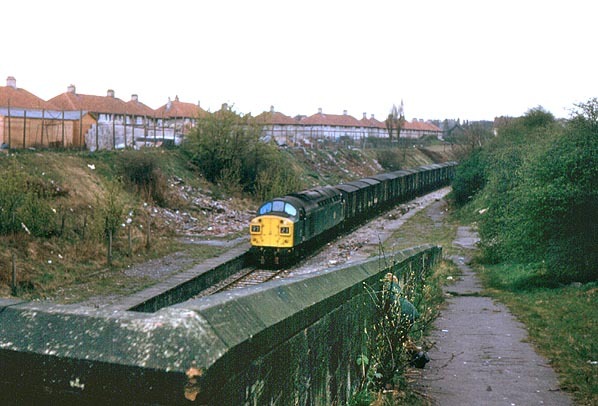 British Rail lifted the line between Huskisson and Hunts Cross in the early months of 1979. 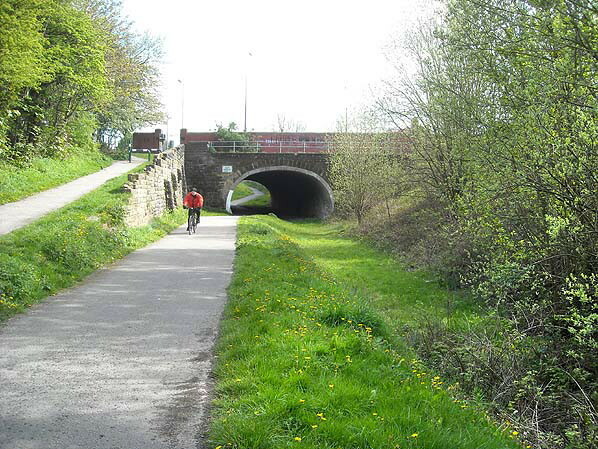 In the late 1980s a footpath and cycleway called the ‘Liverpool Loopline Path’, part of the Trans-Pennine Trail, was created through the site of Knotty Ash station. A supermarket was built on the goods yard in the 1990s. 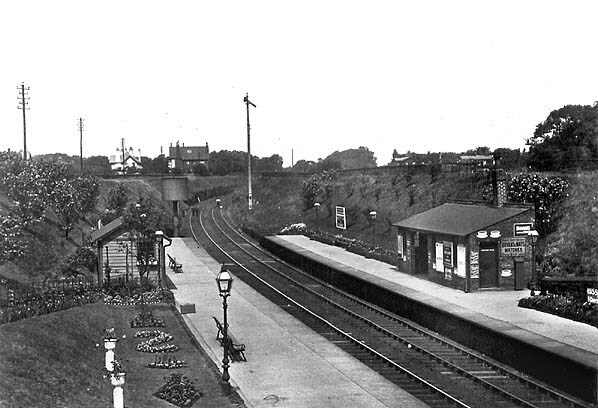 Knotty Ash & Stanley station looking north in the early years of the twentieth century. The station gardens were a prominent feature. Knotty Ash & Stanley station shown on a six-inch scale map from 1894. Knotty Ash & Stanley shown on a 1908 map. 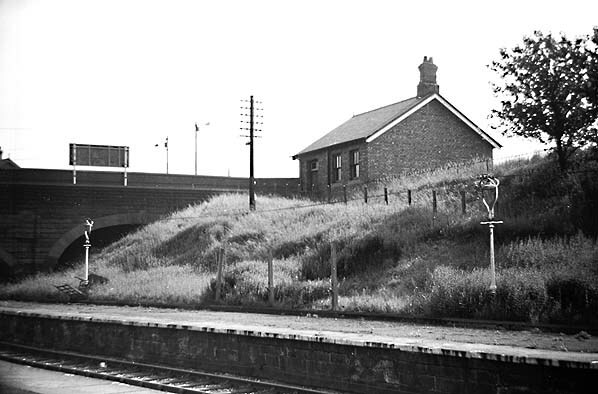 The station is shown in its original form before East Prescot Road was widened. A plan of Knotty Ash station from 1923. Click here to see a very large version. 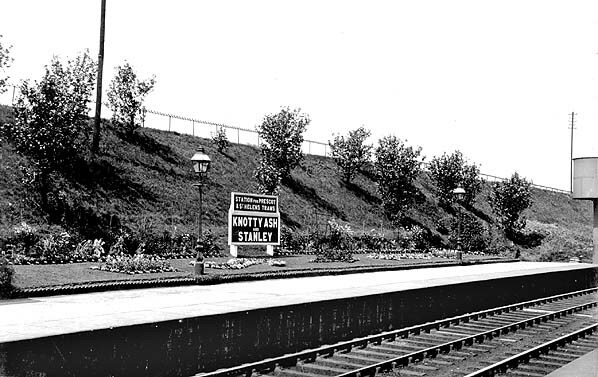 The north end of the down platform at Knotty Ash & Stanley in the 1930s. The station sign advises passengers that they could change at the station for trams to Prescot. 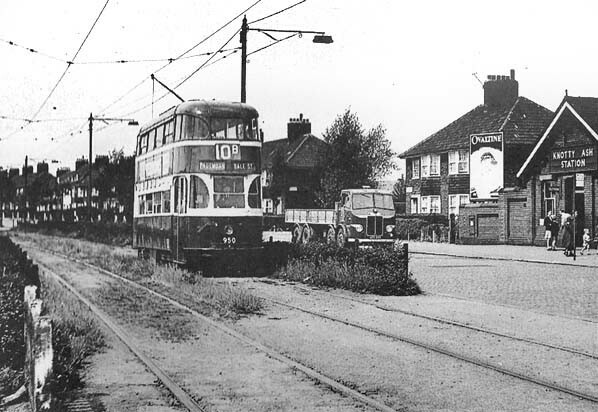 Knotty Ash & Stanley station is seen to the right in this view looking west along East Prescot Road in the early 1950s. The road had been widened in the early 1930s, and the original station building had been demolished to make space. The original station building had straddled the line but its replacement was located on the west side. Prominent in the photograph is Liverpool Corporation Baby Grand tram number 950. The tram is seen heading east towards Page Moss. From 18 May 1903 trams were able to run between Liverpool and St Helens along what was the longest tramway in the Country. A reserved track for trams was created at this location when the road was widened. When this view was taken the tramway extended only as far as Longview, having closed between there and Prescot in 1949. Looking south along the down direction platform at Knotty Ash & Stanley station in 1954. The buildings on the platforms date from the early 1930s when East Prescot Road was widened. The original street-level station had to be demolished and a much smaller structure replaced it. To compensate, larger buildings were erected on the platforms. 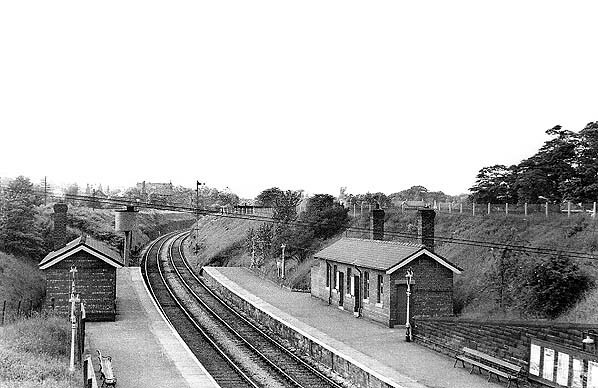 Knotty Ash & Stanley station looking north in 1954. Looking south-west towards the street level booking office at Knotty Ash & Stanley from the up platform after closure in 1961. 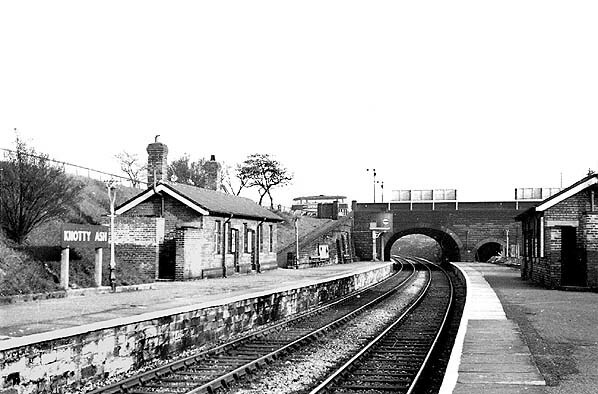 Knotty Ash & Stanley station looking north in June 1969.
nothing ran after August 1975. The south end of Knotty Ash & Stanley in 1978. 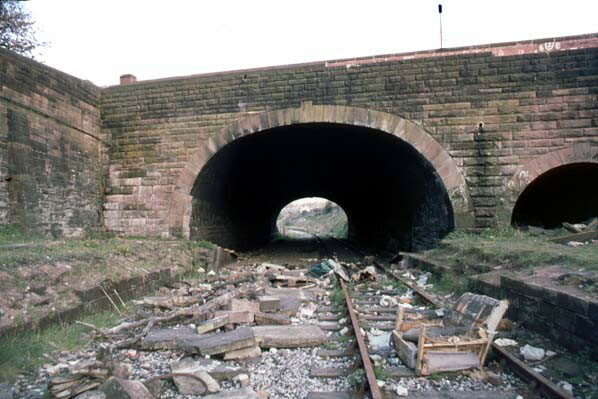 From August 1975 until the early months of 1979 the line through Knotty Ash lay out of use but in situ. When the track-lifting trains ran this way in 1979 they must have had to remove many obstacles from the track to allow safe passage. Knotty Ash & Stanley station looking south on 5 March 1983. Looking south along the up platform at Knotty Ash & Stanley station on 24 April 2012. Knotty Ash & Stanley station at Street level on 29 December 2012. 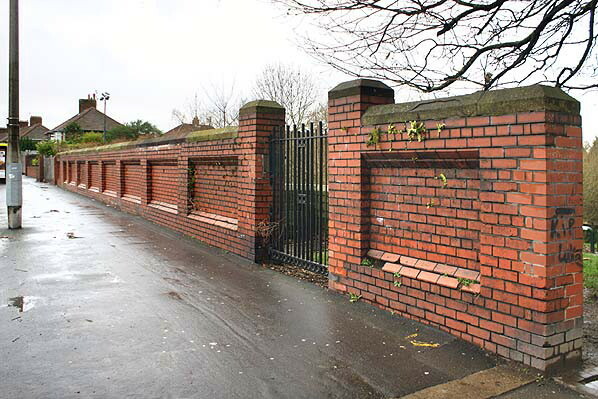 The wall dates from the early 1930s when East Prescot Road was widened. The gate in the foreground provided access to the up platform (southbound). The ticket office was on the far side of the bridge at the end of the red brick wall.